Welcome to arduino projects 4u. 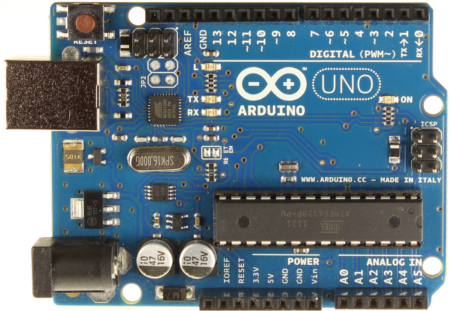 The site that is all about the arduino and what you can do with it. There are many arduino projects with various hardware / software combinations including the design of arduino shields. There is a section about interfacing the arduino to many common integrated circuits. These include accelerometers, gyroscopes and many others. There is also an arduino webshop where you can buy some of the circuit boards i talk about on some of the pages. Have fun and enjoy. Before going on i would like to start to explain what an arduino is to those of you that have never heard of it. Yes those people still exist. Well an arduino is a conveniently packages microprocessor with some peripherals mounted on a circuit board. When you say it like that it does not sound very exciting but the arduino really is something special. First the microprocessor is an avr. On the arduino uno and leonardo the atmega328p is used. This is run at 16MHz so that you get enough speed to comfortably be able to execute C++ programmes. That is the second plus point of the arduino in that there is a special IDE with which you can readily program the processor. There is a bootloader onboard and all the interfacing is done in the arduino IDE. You dont need to cater for linked compiler seperately. The layout of the board is also rather special in that almost all the pins from the processor are brought out to strategically positioned pins at the peripheral of the board. These are standardised so that you can plug in add on boards called shields. Because of the standard positions of the pins the shields can simply be disigned to suit the pin locations. There is some other electronics on the boards to take care of the power supply. You can use 6-12Volts and regulators take that down to the 5Volt the arduino uses to power the microprocessor and 3.3Volt it also has onboard. There is also some logic which switches the reset so that the arduino IDE can load the program into the avr flash memory without having to press the reset botton. There is an ICSP port through which you can program the avr directly should you wish to do so. Finally the USB port is brought out to a mini usb connector which can be used to power the board and simultaneously program it. So now to the main goodies of this site. These are the example applications. The arduino projects describe many cool projects you also can try. Arduino leonardo is a page specifically about that board type and here you can also find some smaller projects. Then the arduino tutorial where you can get some specific tips on programming and also you can find simple integrated circuit interface descriptions such as accelerometers and gyroscopes. The arduino shield page is about some shields i have worked with or have designed. All the boards i have designed can be found back in the arduino webshop page. If you want to know something more about me or the website please look at the about us page. I hope you enjoy the website.